Will Bird is a legendary Cree bush pilot, now lying in a coma in a hospital in his hometown of Moose Factory, Ontario. His niece Annie Bird, beautiful and self-reliant, has returned from her own perilous journey to sit beside his bed. Broken in different ways, the two take silent communion in their unspoken kinship, and the story that unfolds is rife with heartbreak, fierce love, ancient blood feuds, mysterious disappearances, fires, plane crashes, murders, and the bonds that hold a family, and a people, together. As Will and Annie reveal their secrets-the tragic betrayal that cost Will his family, Annie's desperate search for her missing sister, the famous model Suzanne-a remarkable saga of resilience and destiny takes shape. From the dangerous bush country of upper Canada to the drug-fueled glamour of the Manhattan club scene, Joseph Boyden tracks his characters with a keen eye for the telling detail and a rare empathy for the empty places concealed within the heart. 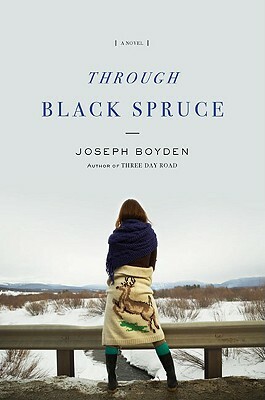 Sure to appeal to readers of Louise Erdrich and Jim Harrison, Through Black Spruce establishes Boyden as a writer of startling originality and uncommon power.